How Do You Spell Addiction? L-E-T-T-E-R-P-R-E-S-S.
Word games? I love ‘em. Give me a jumble of letters and a grid and I'll go to town. One great thing about the advent of smartphones is how they've ushered in a major re-think of the word game DNA. So, last week, when a neighbor mentioned that a new iOS word game was spreading like wildfire through his workplace, I was all ears. Then I started playing Letterpress over the weekend. I can't say that it's affected my productivity as much as Hurricane Sandy has, but it's damn close. Letterpress feels more cutthroat than Scrabble or Words With Friends. That's probably because both players are pulling from the same pool of letters. The tension that accompanies every turn rotates on one simple principle: what's your opponent seeing that you're not? 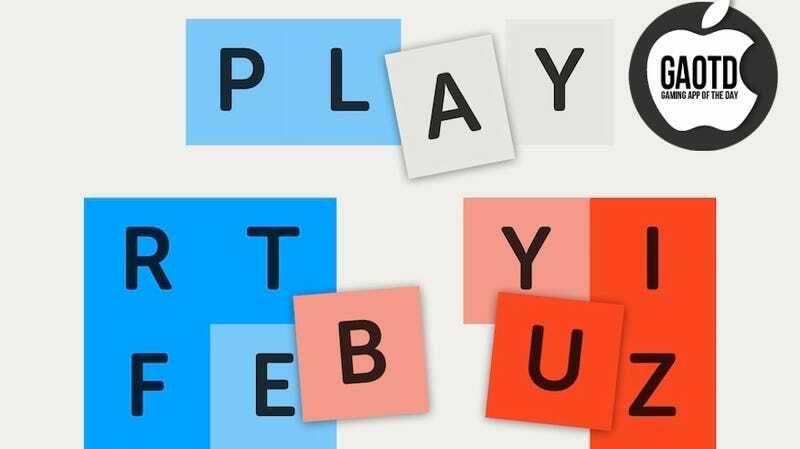 Word games are essentially all about showing off how clever you are. The Scrabble model of wordplay distributes letters, which players zealously hide lest anyone get an unfair advantage. When you hide your letters as in Scrabble, that revelation comes from a secret place. Letterpress has that burst of creativity come as an ambush in plain sight. So it becomes something like "Oh, look, there's a massive PYTHON on the board. Let me use it to crush you!" The other aspect of Letterpress that's addictive is how it channels the real-estate landgrab of strategy games. You can capture letters by surrounding them with other squares of the same color, making that slice of Letterpress' 5x5 grid yours alone. Since the game ends when all letters are claimed, acquiring tiles is key to amassing the points. This fuels the frantic pace at which Letterpress moves. It's a compulsive kind of fun that comes from Letterpress. You pay to unlock more functionality but the free version is great all on its own. The Game Center troubles that locked up matches seemed to be addressed. So, go grab this one. Just be sure to consume-and gloat-in moderation.